Mist settled over the Valley as Mark Hopey and Kathy Gunther walked through the tall dewey grass of Welch Farm, monitoring birds to put toward the station’s last set of data for the year. Hopey and Kathy, who work for the Southern Appalachian Raptor Research, travel to four stations across western North Carolina every summer. For the past four years, the organization has gathered research at Welch Farm. 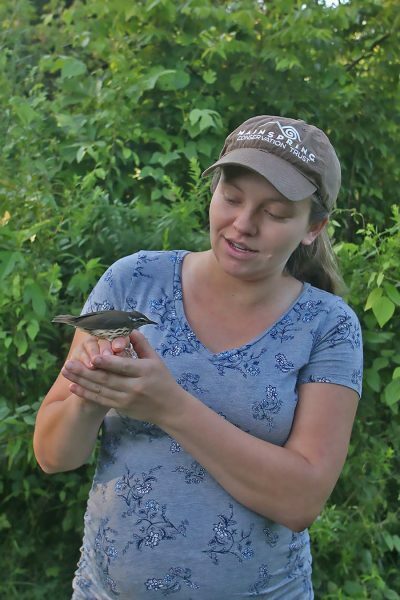 For 10 days, Hopey, Kathy and other members of their team have taken measurements of mostly songbirds to send to the Institute of Bird Populations. Welch Farm is one of about 500 stations nationwide that gathers such information. “Our goal is to collect data in different habitats to see what’s breeding and what’s surviving,” Gunther said. Owned by Mainspring Conservation Trust, the farm is not managed for agriculture. The undeveloped land’s thick brush and river allow for birds to thrive and return every year. Hopey said unlike the other three stations, Welch Farm’s habitat provides a home for Louisiana waterthrush and willow flycatchers. This year’s most common species of bird found at the site included the gray catbird. Hopey and Kathy catch the birds through setting up 10 nets around the farm. Each year, the nets are placed in the same locations. Once removed safely from the nets, they take the birds’ measurements, then release them back where they were found. If the bird has a numbered band on its leg, they mark down its identification. If not, they usually place a band around the bird’s leg. In addition to members of Southern Appalachian Raptor Research, volunteers contribute to the Welch Farm bird monitoring. Trekking through the farm during the early morning hours on July 30, Bob and Lynn Appleget took their bird-watching to a new level. Lynn said she mostly watches birds from her property, but never receives the opportunity to get hands-on experience with them. exploring, experts advise outdoor enthusiasts to take care before moving rocks and changing habitat. The rocks and area surrounding them provide natural homes for insects, frogs and salamanders, and Jason Meader, aquatics program manager with Mainspring Conservation Trust, says innocent disturbances from curious explorers have an impact. 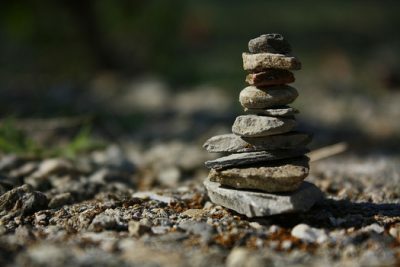 “When you move those rocks, when you disturb those to a large extent, you dislodge the insects, they drift downstream and, over time, with enough impact, you could probably notice a degradation in that area,” he explains. The public is invited to participate in “biomonitoring” surveys of breeding birds this summer, at properties Mainspring Conservation Trust has conserved. Scheduled events at the Welch Farm in Cherokee County include June 27, July 8, 22, 30, and August 8, from 7:00 am to 11:00 am (weather permitting). In Macon County, events at Cowee Mound are scheduled for June 25, July 5, 14, 23, and August 2. These also run from 7:00 am to 11:00 am. Children and adults of all ages can volunteer with nationally-recognized research work that monitors the health and reproduction of birds. Participants will provide hands-on assistance in all aspects of the survey work under the training and supervision from Southern Appalachian Raptor Research (SARR) field biologists. The bird monitoring work is based on the Monitoring Avian Productivity and Survivorship (MAPS) protocol. MAPS is a nationwide program coordinated by the Institute for Bird Populations in Point Reyes, CA. 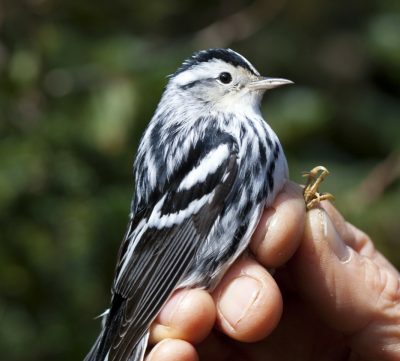 The MAPS program includes a continent-wide network of over 500 mist netting stations and is designed to monitor productivity, survivorship, and population trends of breeding birds throughout North America. Analyses of the resulting banding data provide critical information relating to the ecology, conservation, and management of North American landbird populations, and the factors responsible for changes in their populations. This is the third year that SARR has been conducting the bird monitoring surveys in Cherokee County, and the seventh year at sites in Macon County. This program is a result of a partnership between Mainspring, SARR, and EBCI’s Natural Resources program. The program is sponsored by the Cherokee Preservation Foundation’s Revitalization of Traditional Cherokee Artisan Resources (RTCAR) initiative, the Eastern Band of Cherokee Indians, the U.S. Fish and Wildlife Service, and the Coweeta Long Term Ecological Research program. The survey events may be rescheduled due to weather. Click here for an upt-to-date calendar of survey dates. For more information, please contact Mark Hopey.